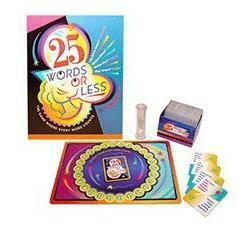 If you're looking for a great grown-up party game, 25 Words or Less is a great choice. If you are old enough to remember watching "Name That Tune'' on television, you already understand the concept of this game. Instead of trying to guess songs in a certain number of notes, with this game players try to guess words with as few clues as possible. This game is best played with a group of people. Players separate into two teams, and one player on each team takes on the role of being the clue giver. All equipment needed to play the game is included in the set. The game consists simply of a game board featuring circles numbered 0 through 25 (one for each possible clue), two deck of cards, and a sand timer. Each team has its own deck of word cards. The clue giver draws a card that has five words on it, and the fun begins. Each team's clue giver bids on how many clues he or she thinks will have to be given to get the team members team to correctly say all the words on the card in one minute or less. The highest possible bid is 25 clues, and players usually don't attempt to go any lower than a bid of seven clues. Clue givers bid back and forth until one of them becomes unwilling to attempt a lower number of clues. 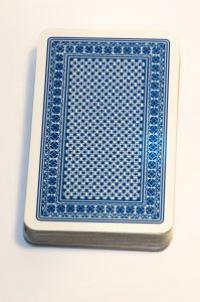 The player who offers the lowest number of clues "wins" the right to attempt the card with his or her teammates. The clue giver starts providing clues, which have to be given in the form of words. Making any kinds of gestures is off-limits, but using meaningful inflections is fine. Once the clue giver starts offering clues, his or her teammates attempt to guess the words on the card based on the clues. Wrong guesses do not count against the team. Each word the clue giver says counts toward the bid number of clues. The opposing team's clue giver takes on the role of judge, counting off every word the clue giver utters using the game timer and the numbered game board. To win the card, the team must guess all five words correctly before the one minute time limit expires. If the team members are unable to do so, or if the clue giver exceeds the number of clues bid, the card goes to the opposing team and another round begins. The first team to accrue ten cards wins the game. The 25 Words or Less game is really popular, and was even named a Games Magazine game of the year in 1997. An updated edition was released in 2006, so if you still have the old version you might want to consider an upgrade. It's designed for players 13 and over, and requires a minimum of four people. However, it's a lot more fun when there are several people on each team. Many families have a tradition of playing 25 Words or Less on holidays or during other family gatherings. This game is a great choice for a party. It's a unique way to get people talking, laughing, and working together toward a common goal. This one of the few games that can easily be played with a large number of people without becoming cumbersome or extremely lengthy. The next time you're in charge of planning the entertainment for a get together, consider spending at least part of the evening playing this hilarious game.